Known for realistic, exquisite reproductions of still life images, it is no coincidence that Javier Mulio is simply known as Javier among his international list of collectors. Hailing from the artistically popular Alcoy (Alicante) Spain, Javier was born December 24, 1957, and was inspired by the artists around him at an early age. He started painting at fourteen and quickly began formal training four years later. From 1962 to 1971, Javier studied at the Virgen de los Lirios in his hometown and remained there while he received a Fourth Degree Certificate. He also studied at the School of Mila Gomez between 1973 and 1976. His personal style and technique blend his interests in photography with the styles he learned under the Classic Master Zurbaran and instructor Mila Gomez. Javier credits his admiration and studies of Salvador Dali with inspiring him to explore the possibilities of art. Javier discovered great passion and success in depicting his favorite still life subjects – flowers and fruit. 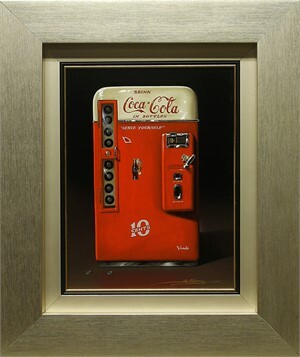 His style lends perception, elegance and simplicity to the objects he portrays. By identifying the beauty and small details of the world around him, a magnificent still life takes form in Javier's paintings. 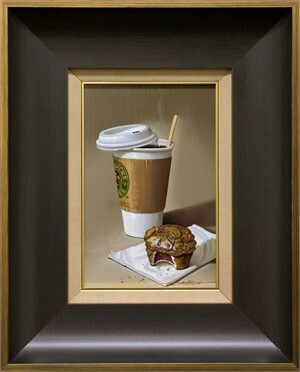 Upon completing his education, Javier began painting professionally and has since become internationally recognized for the realistic, small details he captures in his still life images. His works are included in private collections throughout Japan, Saudi Arabia, Jakarta, Bahrain, Holland and the United States. Collectors include a Saudi Arabian Prince, and many other important aristocrats and business people throughout the world. Javier's style has met with great success, including international exhibitions at the Galeria Sanchez, Granada, Spain in 1982; Galeria Aquado, Logrono, Spain in 1995 and Galeria Soria, Chateauroux, France in 1996. In 1997 his work became available in the United States, where he has enjoyed further recognition at national art shows including the New York Artexpo, International Atlanta Art Buyers Caravan and numerous One Man Shows across the United States. Known for realistic, exquisite reproductions of still life images, it is no coincidence that Javier Mulio is simply known as Javier among his international list of collectors. Hailing from the artistically popular Alcoy (Alicante) Spain, Javier was born December 24, 1957, and was inspired by the artists around him at an early age. He started painting at fourteen and quickly began formal training four years later. From 1962 to 1971, Javier studied at the Virgen de los Lirios in his hometown and remained there while he received a Fourth Degree Certificate. He also studied at the School of Mila Gomez between 1973 and 1976. His personal style and technique blend his interests in photography with the styles he learned under the Classic Master Zurbaran and instructor Mila Gomez. Javier credits his admiration and studies of Salvador Dali with inspiring him to explore the possibilities of art. Javier discovered great passion and success in depicting his favorite still life subjects – flowers and fruit. 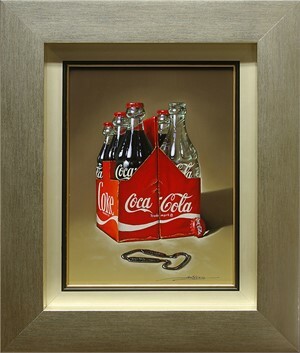 His style lends perception, elegance and simplicity to the objects he portrays. By identifying the beauty and small details of the world around him, a magnificent still life takes form in Javier's paintings. Upon completing his education, Javier began painting professionally and has since become internationally recognized for the realistic, small details he captures in his still life images. His works are included in private collections throughout Japan, Saudi Arabia, Jakarta, Bahrain, Holland and the United States. Collectors include a Saudi Arabian Prince, and many other important aristocrats and business people throughout the world. Javier's style has met with great success, including international exhibitions at the Galeria Sanchez, Granada, Spain in 1982; Galeria Aquado, Logrono, Spain in 1995 and Galeria Soria, Chateauroux, France in 1996. In 1997 his work became available in the United States, where he has enjoyed further recognition at national art shows including the New York Artexpo, International Atlanta Art Buyers Caravan and numerous One Man Shows across the United States.